I know, I know... my blogging has been LAMENTABLE this past wee (long) while. On the plus side, however, I have so much news on the writing front, I’m positively bursting with it. I’m really chuffed to announce that I have two - yes, TWO - new books out, so for all you who have been nagging me about this, I think I can hold my head up and say I am OFF THE HOOK. First out of the McPhee stable is NINE LIVES, the story of a troubled teen who commits suicide by jumping off the Forth Road Bridge and then finds he’s not allowed into heaven until he pays a penance by saving the lives of nine people on earth. I dedicated this book to our foster son Ronan, who has had his own teen challenges but who thankfully hasn’t resorted to leaping off bridges as a solution. Hot on the heels of NINE LIVES is NEMESIS, which tells the tale of identical twins Roxanne and Zoe, one of whom steals her sister’s life. This one was dedicated to my own twin sisters, Kerry and Dale, whose non-identical looks mean neither of them could ever pull that stunt on the other, but who nevertheless deserved the dedication for steering me through the choppy waters of adolescence. Now I’m going to let you into a little secret. I didn’t WRITE either of those books last year. I wrote NINE LIVES a few years ago, back when you still had to pay to drive across the Forth Road Bridge and before I had so much as an agent, and I wrote NEMESIS after BACK TO YOU came out in 2015. NINE LIVES came o-so-close to being published by Canongate. Anyone who’s ever attempted to get a book published will know the frustration of coming o-so-close, however: without that book deal, it’s just more fodder for the slush pile. 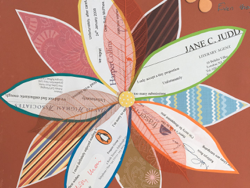 I left the manuscript on my laptop, made a scrapbook flower out of my many rejection letters (see pic above) and started another book, SLEEPING DOGS, which got me my first agent but not that elusive book deal, as it was felt to have too autobiographical a feel for an unknown author. So SLEEPING DOGS joined NINE LIVES in the not-now-but-maybe-someday folder on my laptop. After that I wrote HUSBANDS AND LIES, which Ebury snapped up and immediately commissioned a second book, THE RUNAWAY WIFE. I was over the moon. Life was sweet. I had a book deal and was a bona fide published author. A year later I wrote NEMESIS and submitted it to my publisher. I held my breath. I was so excited: the feedback I’d had from my trusted inner circle was that it was the best I’d done so far. I couldn’t wait to hear back from Ebury. They didn’t want it. Now, I may be being a bit cynical here, but there was some political wrangling going on at the time, and I have a sneaky feeling my publishers took umbrage at my then agent’s advice to keep them in the dark about this new book and make them bid for it, so decided to cut me loose. The publishing industry can be fickle like that, unless you’re a celebrity or an online phenomenon with 250,000 followers. NEMESIS, as you’ve probably guessed, joined NINE LIVES and SLEEPING DOGS in that folder on my laptop which, frankly, was getting way too full for my liking. I ploughed on, and in 2016 BACK TO YOU was published by my German publisher, Weltbild, and after that in the UK. But still those other three books languished in my laptop. It was only when I was stuck for something to give Ronan for Christmas that it occurred to me to publish NINE LIVES myself. I have a fellow author friend who went down the self-publishing route a few years back, after the industry did the dirty on her, and she is having great success with her books, not to mention enjoying full control of the publishing process. Bear in mind that when you land that elusive book deal, you hand over control of a huge part of your creation - the title, the cover, the marketing - to a third party that, inevitably, doesn’t feel as passionately as you do about it. Oh, and that lovely big advance they pay you? That’s not a handout. You have to pay it back - every penny - before you can start making any money from royalties. What my friend did gave me confidence to go for it, to design my own cover, write my own back-of-the-book blurb, tackle the formatting, set up the payment options, and get NINE LIVES off the laptop and into the big wide world. What’s more, I LOVED doing it. So much so that I couldn’t wait to do the same with NEMESIS, which became my twin sisters’ birthday presents a couple of weeks ago. And it got me thinking. If I could do this for myself and my own literary career, I can do it for other aspiring authors. Those who have come o-so-close, but for whom the traditional path to publishing has proven impossible to gain any kind of purchase on. It’s harder now than ever: publishing houses are being squeezed to suffocation, and they’re taking the easy route of only backing what they consider to be a sure thing. When I was out shopping before Christmas I found a stand in our local supermarket that contained cookbooks by Jamie Oliver and Nigella Lawson, a Jensen Button autobiography, and the latest Dan Brown offering. What do all of these have in common? They’re an easy sell. They’re guaranteed to recoup any advance in a matter of months. There’s no pressure on a publishing house’s non-existent marketing budget. What does it mean for the rest of us? There’s no nurturing of new talent. No risk-taking. Not even, frankly, much in the way of loyalty to already-signed authors. In October last year former Scottish publisher of the year Freight Books went into liquidation, offering signed authors the opportunity to buy back copies of their own books. The industry is not what it used to be, and frankly I don’t much like the look of what it’s evolving into. So I’ve decided it’s time to take action. I’ve put together a crack team of experts from the publishing industry - people with hands-on experience in everything from writing and editing to design to marketing - and we’re starting up our own publishing house. The focus is going to be on putting control back into the author’s hands and getting their work out there. We’re still working on the details - we don’t even have a name yet! - but we plan to be up and running by Easter, when we’ll be opening our doors to submissions. We won’t be paying hefty advances which we then claw back by taking 90% of royalty payments: instead we’ll be offering an affordable route to publication which we believe will revolutionise the way we all think about publishing. Watch this space. And in the meantime, if you feel so inclined, take a look at NINE LIVES and NEMESIS. I’m proud as punch of the pair of them.